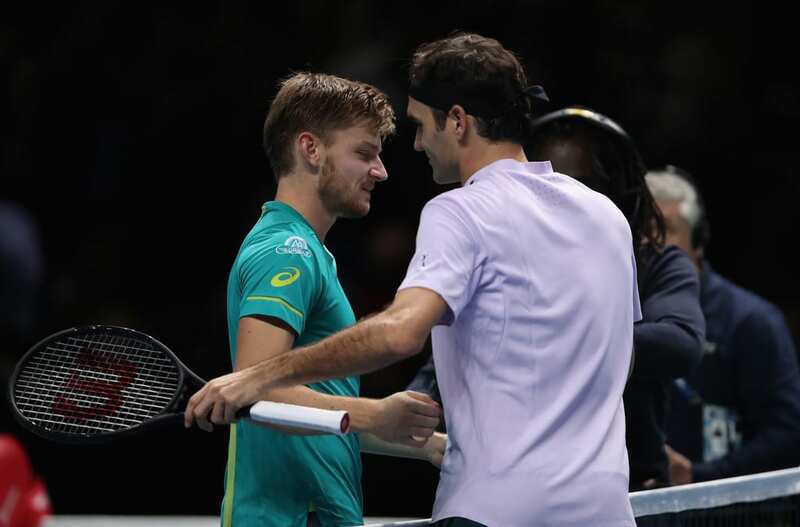 David Goffin finally got over the line against Roger Federer with a commanding 2-6 6-3 6-4 victory to make the final at the World Tour Finals on his first-ever appearance. Few gave the diminutive Belgian a chance based on his six straight losses against the Swiss but he came from a set down to take out the second seed and set up a final against Grigor Dimitrov. An unexpected victory perhaps but the World Number 6 played solid tennis after a nervy start and was able to keep his level high throughout the 1 hour and 45-minute encounter to deserve the win. Roger, on the other hand, struggled as he has all week with his game going from sublime to error-strewn all too readily. Federer won the toss and elected to receive, a choice that's served him well in recent matches as he broke for 1-0 after Goffin had saved four break points. Roger consolidated for 2-0 and the early lead put the wind in his sails as he played some splendid points to take the set 6-2. With Goffin's weak record against the Swiss I figured the match would be a foregone conclusion but the Belgian put his early woes behind him as he broke to lead 2-0 at the start of the second. A love hold consolidated the break and suddenly he was in the match. With Roger's forehand misfiring, Goffin progressed to a 5-2 lead after the Swiss missed his sole break point chance of the set. Goffin then served it out to love 6-3. With Roger serving first in the one set shootout he held to 15 to get on the board. Goffin then held from 0-30 and was able to break with some crisp ball striking to lead 2-1. The Belgian had looked nervous trying to close out the match against Nadal earlier this week and in game four he slipped to 15-40 but Roger just couldn't land the right blows as Goffin held for 3-1. That put him firmly in control and although Roger was able to take care of his own service games Goffin held firm to take it 6-4. So tough loss here for the GOAT and not one many of us saw coming. Roger was obviously the firm favourite going in and I thought it was a straight sets win but he just couldn't summon his best tennis for the duration of the match. The Swiss had schooled Goffin in Basel and got off to a great start here taking the opener 6-2 but from there the match turned on its head as Goffin kept his base level a notch above Roger's which made the difference. As many a pundit has told us live on air ‘the margins are small at this level' and it's certainly true here. If we go all the way back to the French Open in 2012 we saw what Goffin can do from the back of the court if Roger's not quite on the money so 5 years on it's about time he finally went one better than just a set. That's why I don't think it's too big a shock when you consider how the tournament has panned out and the level we've seen from Fed. He's played well in fits and starts but never really managed to hit the heights. His coach Severin Luthi said before the match he was favourite but had to play better if he wanted to win the title and he was spot on. Great first set but couldn't keep his level high enough as Goffin played solidly throughout to bag one of his biggest career wins. My 3. win, and 2. this year! Time for the small’s! Thanks Jonathan, for a sincere and sober report. I couldn’t agree more. We have to be most grateful for this Fed-year, and no less for his passion and brilliance with tennis still there, regardless. Cannot be enough encouraged! Tough loss and dismal end to such a awesome season. Roger didnt seem comfortable throughout the entire tourney maybe too much tennis or just tired from winning (as if – eyes rolling), He came close to being no1 but who cares really…we fan want him to win more GS next year. Honestly it will be a tough act to repeat but I do hope/pray for 3 things come 2018 season – retain both his GS titles (pls let it be a good draw). Win 7th WTF title to break the stupid jinx. Thanks. Yeah I will try do a 2017 recap post or something along those lines. for Davide and perhaps relieved to be done with it all.As Fed himself has said,he can’t win them all,and as his fans we should just be amazed and give credit for such a great year in the autumn of his career. I quite agree, Annie: I thought Roger looked almost relieved that it was over, which, along with the horrible play *and* the first serve problems and tetchiness earlier in the week, made me wonder whether something was going on that we didn’t know about. (I’m also still not convinced that the “back” excuse for pulling out of Bercy was just an excuse.) And yes, I thought he was genuinely pleased for David, too. I was actually wondering whether he was looking at the prospect of another final where he wouldn’t be able to play properly, and glad it wasn’t going to happen. I think it was a surprise but not like a huge shock or stunning loss. Fed had played an ok tournament, was the favourite but hadn’t looked untouchable so maybe it was coming. Was waiting for your write up, thanks Jonathan, for summing it up so well. Yes, it was a “crappy ” end, because this was really a super opportunity for Federer, and also because of the unexpectedly tame way he played most of sets 2 and 3. Kind of reminded us that he’s human, very much so, after so many superhuman performances this year. 1. Goffin is really likeable, on and off court. Even Fed seemed rather pleased that Goffin had won this. Much, much better to lose to him than to players like Novak and Rafa (or even Delpo). 2. I guess it’s better in the long run if Roger loses a match due to sudden error-prone play than due to any niggling injury (like in Montreal). So, it’s OK.
It’ll be nice to see a big final between Goffin and Dimitrov (DG vs. GD). They both play attractive tennis when in form. Also, they’re my favourites from the unheralded middle generation caught between the Big 5 and the overhyped Next Gen. Finally, so grateful for this year as a Fedfan. Australian Open was the best gift Roger gave his fans. I would have been perfectly happy with just that. Every thing else has been a whole box of cherries. As you said, perhaps another such season will never happen. He’s 36 after all. And that’s all the more reason to cherish this Fed-year. Yes, let’s hope they *are* both in form, and give us a good one. Definitely not a breadsticking 🙂 Wonder if Goffin’s come back to earth yet? I hope so, too! Another walloping would be terrible! Well, I have to say, I’m pretty certain that was a much better final than Dimi vs. Fed would have been. Kudos to both men. Agree with you, Alison. I enjoyed watching it without any nail biting. Thought Goffin would pull it off as he was playing some superb shots. But Dimitrov stubbornly hung on and capitalised on Goffin’s errors. Good for them! Indeed, I didn’t watch but was a good final from all reports. Nor sure who I wanted to win, Dimitrov is ok, Goffin I guess ok too. Not sure either of them are massively likeable though for me. But I’d prob pick Dimi as preferred winner. Watching his presser it’s clear Roger has some degree of a cold going on – coughing off to the side, wiping his nose against his sleeve… I think he just didn’t have the energy, which is consistent with what we’ve seen all week. At the same time, David was really dialled in, hitting some beautifully placed angles & making Roger run back & forth a lot. I was interested to hear Roger say David had ‘crushed’ him more than once in practice, so he wasn’t shocked to see him find a way to do it in a match. As others have said, sure, it’s a disappointment right at the end, but the season as a whole has been SO phenomenal. As I saw someone say on Twitter, it would have been like extra sprinkles on a cake that’s already covered with them. We want him playing as long as he can, & that means being happy for him to do whatever he needs for continued health & joy on the court. That would explain a lot – the brain farts and everything. I hadn’t picked that up from his on-court interviews, which is all I’d heard. I thought he ran out of energy, mental and physical, in the second set. I was concerned – I think it was during the game where Goffin broke him – that he was just getting into a major baseline slugfest with Goffin without doing anything proactive himself, which was odd, and my concern only grew after that, really. I’d expected him to have a one-set brain fart – I’m used to that now – but I had expected him to claw the third set back, but he never did, and when he went down a break again I got really worried, and with good reason, obviously..
Didn’t someone mention he was grunting more than usual, too? Interesting: just watching Friday’s match, and Sue Barker said Roger didn’t practise on Wednesday, and should we be concerned? (I guess they have spies up at Baron’s Court 🙂 ) Possibly indicative of him not being that well? Anyway, I know he’s got a young family and all, but he does get a lot of colds, doesn’t he? Is echinacea on the banned substances list, or something? Sounds as though his immune system could do with some support. If he was sick or injured in some way, we will probably never find out. Or 2 years down the road Fed mentions that he had the energy of a slug. Not practicing says a lot. Actually, in one of his pressers he says his team told him to take the day off on Wednesday. He had a cold at Wimbledon though. So can’t really use it as an excuse for the loss. Oh, didn’t even think of looking for that on YouTube! I was feeling REALLY grumpy after the loss. Boy, did I want him to win this tournament. But, then again, like most of you say: it’s been a phenomenal year, so I shouldn’t complain too much. (and I consider myself lucky NOT going to the ATP finals, although I intended to). Wanda had a ticket unfortunately so missed out, but at least got to see a good final. but overall this still a good year 2 with 2 slam I hope he can get 20th next year. Day 2 of my usual 3 day slump after a Fed loss. I’ve discovered it’s best to ride the wave and it will end on it’s own. I have already watched the last match of the Laver Cup and the 5th set of the AO. The fire in Roger’s eyes and the intensity of play that I saw in those matches were missing at the O2. I get the feeling Roger was burned out and try as he might, it just wasn’t there to get over the finish line. Hats off to Goffin who played well. I will watch the final and it doesn’t matter to me who ends up with the trophy. A huge thank you Roger Federer for this amazing year. No words to describe what you give the world of tennis. Another thank you to all the fans here who pour their heart out and write some interesting, informative and at times comforting posts. And of course, thank you to Jonathan. You never let us down. You always deliver an awesome post after every match. And we fans have a voice to vent and write about our love of Roger. Well said, Sue, I join you in your beautifully stated comment. Yes, Thank You, Roger, for giving us much joy and more to come I am sure. Last, but not least, Thank You, Jonathan for all your well stated analysis of Roger’s matches. Tennis blog at its best. Ah in press? I am surprised anyone noticed, I know John Lewis start Christmas in October but it’s a bit early! Fed preferred to fail in semis after somehow even match than take maybe heavy beating from Dimitrov in the final. The last would hurt more. Just like he “avoided” beating from Nadal in the time, when Rafa beating Roger was a rule rather than incident. I can understand and accept that. And maybe the time is coming to start to lose to the NEXTGEN (his NEXTGEN are not Milan finalists but guys about 25 just reaching their prime time. I don’t believe, Novak, Andy or Stan to come back to their prime. Fed can still get some big wins 2018 and maybe beyond, but will lose more frequently just THIS NEXTGEN (including Zverev, no matter his age). Would be natural, no? You are probably right PRF, but I don’t feel well about any predicting about Roger’s increasing losing. I wish we go fresh to 2018, not knowing, but still hoping, – just knowing this: anything can happen. Never mind. Of course I’m hoping for more than I can logically expect 😉 , so I will be happy about every match played and won by Fed, but still grateful for him losing (optimally to next generation). I remember Fed telling about his early years and his thanks to former greats (Sampras, Agassi …), that they didn’t retire before allowing him to beat them 🙂 Now it’s the same time coming for Fed. Including just giving young the opportunity to beat him (or at least try to). What about starting new Fed’s record book? Big losses to NextGens. Not in first rounds of ATP250, but in quarters, semi or finals of big events, just like this one to Goffin? Sorry, why would prefer any such thing? Federer has NEVER been afraid of Dimitrov and has no reason to be so. Even at Wimbledon, when Dimitrov was playing some fine tennis, Federer had no trouble with him at all. The loss to Goffin is hard to explain, sure, but I don’t agree with your explanation at all. But it’s fact, Roger was not in big shape in London and Dimitrov was. Goffin too. The loss to Goffin is very easy to explain. Goffin has applied perfect tactics. Going ahead, hitting wide angles, playing serve&volley, attacking returns, before Fed was able to. Goffin tried to do the same against Grigor and was going to win, but committed some stupid errors on big points. Grigor was a lot more passive than in earlier London matches, after he have seen, how Goffin implemented what he was joking about, namely started to do things he normally does not. Was always a step ahead. Taking balls earlier than Fed and stepping into the court deeper than Fed. Full risk. But well rewarded. Surprise for Fed. Could have been surprise for Dimitrov too. Well, Federer has been losing with more regularity since 2008 so it’s no surprises that players coming through are going to get wins against him in the near future. A few thoughts written just before the final starts. Thank you so much Jonathan for your so quick and smart posts all year long. Thank you Fedfans for your so rich comments inside this blog which I discovered one year ago. Christmas will come soon. On top of re-watching Fed matches again and again while waiting for the next season, I don’t know if you will have this kind of idea to give to Santa Claus in your respective countries, but in France, a book full of pictures is about to be available about a sublime tennis year. 2017 : L’année des légendes. Jean Couvercelle is the initiator of Tennis Magazine in France. By the way, I would like to be grateful to all TV cameramen and technicians, photographers (like Marianne Bevis) : with their high quality work, we have a chance to appreciate tennis gestures and attitudes (such as Fed’s footwork, shots or bright smiles after his victories and there were a few ones this year. Tribute to them. – starts with 20… like the twentieth Grand Slam title, maybe ? Cheers FrenchButteRFLy and thanks for sharing, I had not seen that gallery or the book, some great shots! Don’t they have “look inside” features on French shopping websites, or do I need to wait for it to arrive on Amazon.fr? Would really appreciate getting some sort of feel for it. Hello Alison, the book I mention will be available on sale on Nov 29 in France (only as a pre-order now to secure it). I guess it will be available on Amazon.fr too. As for the amount of text vs photos inside, I don’t know yet. Will tell you if I get more infos about it. Nice day ! Oh come on,Federer has never been the one who throws a match because he is frightened of who he might meet with in the next round.On the contrary it is the one with the convenient ‘injuries’ who plays that game. You do realise that the Fed Dimitrov head to head is 6-0.We don’t know why Fed lost against Goffin,who has also never beaten him but troubled him at The French Open in the past,but I would say with certaintity that he did not loose because he was frightened of Dimitrov.Lets see Dimitrov (who I Like)win a slam and then perhaps he will make great players fear him .Or not. Yeah that theory is nonsense. He lost because he was the second best player on the court. Dimitrov wasn’t even in the final at that point either! PRF, you are full of it. Yeah, the only disappointing thing about this was that it wasn’t a fitting end to a vintage season. Fed’s level wasn’t high enough all week, and that’s the difference here. Goffin deserved the win though he came up a bit short vs Dimitrov today. It’d have been nice if Fed could have had his 7th year-end title, and I’m sure it was probably the best chance he’s likely to get for it but how many times did we say that about winning #18? “but how many times did we say that about winning #18?” – Exactly. The future is unpredictable. So please don’t speculate depressingly about it. Hi Jonathan and fellow Fed fans. First of all thank you Jonathan for all your posts. I look forward to reading them for your analysis. They always seem to be right on the mark I sometimes think you are courtside at all Roger’s matches and have a degree in psychiatry as well. Like one other poster said,, I too was so depressed after yesterdays match I re-watched Laver Cup and the last AO set and my mood brightened. I also felt Roger was just glad the season was over and he was genuinely happy for David who deserved the win. I don’t think Roger’s heart has been totally in his matches since the US open and I have secretly thought for some time that if Roger won this he would (not right now but before the AO)) announce his retirement. I believe he has discovered there is quite a lot of life outside of tennis, what with four kids, a multitude of friends, a thriving business, a foundation he is devoted to, more money that he will ever need, etc I know, I should wash my mouth (or brain) with soap for even thinking such a thing but we all know that day is not too far off. I hope I’m wrong and I’m just another Steve Tignor at predictions. 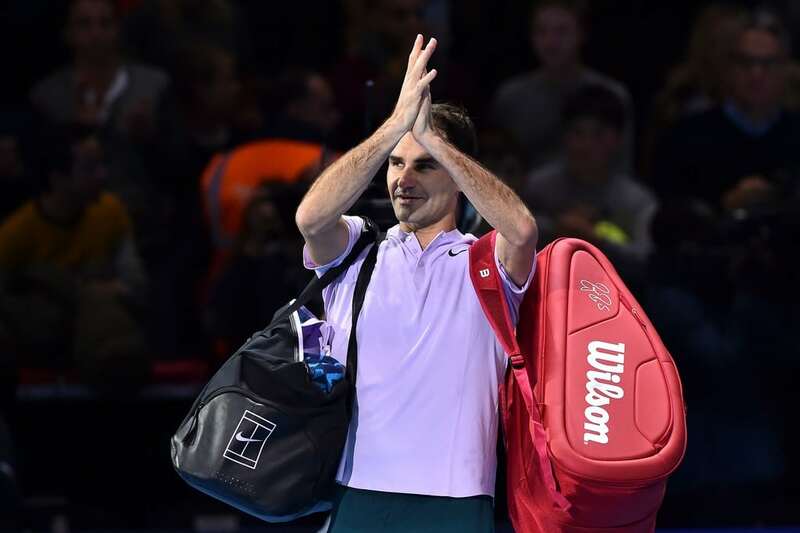 For now nothing but big thanks to Roger for all the pleasure and magic he has given us over the years but especially this year He is a role model and a credit to the entire tennis community and example for every other sport. For now I am going to watch Pete Sampras play Roger in his first appearance on Centre Court at Wimbledon and prepare for (temporary) tennis withdrawal. Thank goodness for U Tube and Apple TV! Merry Christmas, Happy Holidays and a wonderful 2018 to you Jonathan and fellow Rogerites. It’s definitely sooner rather than later but I rermember thinking it’d be 2012 or 13 and he’s somehow played another 3/4 years! I am a Fed fan. But still no regret about his loss to Goffin as I like the hard working nature and down to earth nature of David. I am very happy for Goffin considering the losses to big 4 even after putting great effort. I simply like thIs guy and always wished he should do well. And I am more happy seeing Grigor winning the title. I like his style of play and superb one handen back hand. So in the end no regret. And boy what a dream year for Roger. He have us more than we wished for. Goffin the first man to beat Fedal in an event and not win the title! My club tournament in August I think. Be a pretty solid self burn if you reveal you didn’t get to the semis. Thanks Jonathan and everyone for all you efforts on here it has been magical sharing this Fed goat year and the WTF was made enjoyble by the deserved efforts of all who remained. Congrats Grigor and David, both very likeable and possessing excellent footwork and technique, no antics and it’s good to see them come through. Hope David gets his further reward in Davis Cup as he over came some setbacks with suspect umpiring and the foot injury during clay season so it was fitting he should get to WTF and do well there. Agree Fed did seem very pleased for him, it’s probably a fraction more bearable losing to someone who at least plays decently and shares your ideals of fair play and good manners. Grigor winning is good for Team Eight Feds management group, so if he can’t it is good Grigor could! Enjoy the break and have a happy holiday season and may Roger, like you all, stay safe and healthy for the new year ahead. Yeah would be interesting to see if Goffin would have won some more stuff if he hadn’t had the ankle set back in Paris. PRF: I’ve never been totally au fait with the copyright issue, but aren’t you at risk of breaching copyright if you do that? I’m recalling the JK Rowling/crowdsourcing debates. To be (only a bit) more serious: what about Google Translate ans similar services, translating automatically (hmmm, maybe not my quality ;)) everything you can find in Internet? Did you ever watch those videos I fell upon by chance ? Interview of Roger after his 2004 US Open victory by Charlie Rose. Hi all, a bit late for the therapy party as I’ve just got back from UK. Receive a text during the wedding party at the countryside in Dorset on Saturday afternoon. No wifi whole day so no idea what happened. Gutted and was desperate for a PT therapy. But picked myself up and went to the final next day. It happens to any tennis spectators. Though it turned to be a great match and enjoyed the occasion without any emotional stress which was actually lovely. Both guys played very well. Especially impressed by Goff’s BHs! 2017 became already a sensational year in January as he’s got No.18 and the sunshine double soon after, then Wimby No.8 came as an absolute joy so I don’t complain. I am just grateful he’s still been out there and given us so much! And the last but not least, many thanks for the fantastic job you did throughout this awesome year, Jonathan. Yes, I know what you mean. I watched the final, which I usually don’t if Fed not there and had no stress and no care who was going to be the victor. It wasn’t like a Nadal or Djokovic was winning another. But please, Goffin, wear black shorts next time. Somehow bland colors of his outfits suit well his appearance and humbleness. Should he wear black would mean to starting to fist pumping and jumping like Rafa. Would maybe make him even more aggressive and beating certain, hmmm … more frequently? But his bland outfits are maybe a kind of protective coloration. Who would expect an aggressive play from a guy, you can hardly differentiate from the background? Maybe a kind of stealth technology, his secret weapon 🙂 Go Goff!!! What oh what is Nadal going to do now….use 3 towels? While I don’t like the increase in time, I do like it that it will be enforced using a shot clock. It means Nadal can never average more than 25 seconds. I still don’t understand why 20 seconds are not enough but enforcing it with a compromise is alright I guess. Think Wimbledon 2008 final and you will find how much Nadal abused the shot clock to steal that title from Roger. During that match is when I fell in love with Roger, lol. Yeah, it’s better to have a fair rule and force the compliance than to have a full book of rules and never actually do anything to make sure that they are followed. I’m all for it too. Your acceptation or objections are all but objective, right? Rules are for ensure Roger winning, right? Rules are for Nadal to be forced to give Roger all stolen titles, right? You all understand nothing from tennis. You are against Eyehawk Live instead of linespeople because linespeople iare that romantic! And linespeople can make errors (the best to Roger’s advantage). But you are for the shot clock, because it could help Roger or at least make Nadal crazy. What about new ROGER RULE, allowing him to turn say 10 lost points to won points at his discretion? Well, I think, you answered once my post, informing, that you never played tennis. Or was it Murli? But it looks like Roger has no any single fan (sorry, I’m the exception maybe) loving tennis just like Roger does, maybe only to understand Roger’s love? Whatever your age, risk an hour or more to take first lesson/s and you will see, what happens with your understanding and passion. Yes. Roger is an unique personality, but would you follow him as chess master? Or the best 100 m runner? I will quote one of Bresnik’s rules for tennis training, having also some universal value. If you want to achieve what’s possible, you must try impossible. Try to understand tennis by playing. Impossible? Maybe yes, but you will achieve the possible this way – some understanding of the game, including it’s very individual and personal character – so Paire needs 4 seconds for a serve, Rafa needs 30, Roger 17 and Delpo 2 minutes. All is allowed and should be. If not, you will see so many players serving without concentration, thus making their game nervous and out of balance. Of course, who don’t fit into Fed standards, should go to play golf or poker. You (almost) all too. “Fair rules and force the compliance” (Rui) – think about every aspect of your life controlled by such rules. Any association? Hitler? Stalin? Orwell? It was 25 at ATP level, so I think it makes sense to standardise it across both. I have no idea what you are on about PRF. But I can’t quite work out from your posts, have you played tennis recreationally before which has given you a much greater understanding of the game than any of us here? You don’t really mention it much if you have? Not sure, if this was told to me or to Sid, but assuming it was to me. 1. I’m playing tennis about since Roger is on tour. Yes, this gives more understanding of tennis. I was fan before too and then I sow the difference. But maybe you all play tennis a bit? 3. You did not ask Sid about his “stupidity” essay. So logically you can work out what he is on about. This is a good point for me to leave. 4. I should not disturb you in your religion. In a year or two it’s history, but your religion might survive. For sure without me. I’m not religious. PRF – proper victim work here. Let me be clear about this – if a human being on earth has ever cared even slightly about tennis, then they are not impartial. This includes yourself. I accept some of the more zealous comments come from Federer fans (he plays an impossible style, so people will get superior about it) – but Nadal fans slew the same crap all day long too. Same with Djokovic, Murray. Everyone has an agenda, especially if they support a player. Therefore, the fact you came here, on this LITERAL FEDERER FAN SITE, for impartial commentary almost validates what Sid called you. As for the shot clock, the rationale is the rationale. People have campaigned to change it, not just Federer fans. And not just because of Nadal. That alone says there’s something behind it. Let me disagree. You don’t have in mind the same, when you speak about “impartiality”. No idea, how do you know about ” human being on earth has ever cared even slightly about tennis, then they are not impartial”. I don’t see here any logic, only negative emotions. If you understand “impartial” to mean to support your fave in any case, it’s false, This is simply loyalty against your fave. But not to the limit of telling lies or showing things in a misaligned mirror. According to your definition, it’s right, I don’t belong here. But my point is, I do belong here so long I decide myself to go away or Jon, as blog owner bans me. So far no one of both has happened. And I don’t feel a victim in any sense. I cannot feel offended by someone grinding the word “stupid” and not having anything more to tell. And if you justify your impartiality by others doing the same (this does not apply to me, sorry), you are even proud of feeling impartial. Why not? My point is, I can find in Fed enough inspiration to stay impartial and still feel his fan. Maybe not just like you (all?) feel it. And is it not a bit interesting and adrenaline-stimulating if you have on your LITERALLY FEDFAN SITE someone a bit different, so you can call him stupid if you miss other arguments? My point, you buffoon, is that you really are stupid if you think you aren’t biased. If you want to go by definition, come up with some axioms of logic and use them to prove all your points. But you don’t. Because you can’t. Anything other than logic is open to bias. Basic philosophy. “You buffoon” is your top achievement in logic? Do you really expect me to use strict logical proves of all I’m thinking and writing? Is this expected from everyone here or from me only? Well, it’s going boring. Move on. Make it MAXIMUM to 20 seconds, and have neutral people (maybe it would be better to appoint people who don’t really know tennis?) who can clock the serve delay and give penalties if the serve delay is more than 20 seconds. This should apply for everyone. And there are tennis players who abuse with server times to try to disrupt the opponent’s pace. Yes, and there are players playing monnballs to distract the opponents and gain time for better reaction. This is called tactics. But of course you can arrange shot clock for every shot. Why only for serve? If the return does not hit the court in 1,5 sec. -penalty. You play a lob (what a time wasting) instead of drive volley – penalty. Let’s play tennis as computer game. PRF, you truly are stupid. I mean, how can someone be so stupid? You really are stupid good at the stupidity you’ve been spewing around here. I’m shocked Jon hasn’t booted you out yet. You are…stupidity personified. Your imagination is like a leadless pencil. All readers on this blog should democratically boot this buffoon out of here. I’m shocked too. Yes, my English is not perfect, but your’s for sure is. And you seem to know only one word. And in your elementary schol (probably the last you have visited) no rethoric or logic was teached. And your understanding of democracy let’s me think on some people I have mentioned before. “Should vote democratically” – good definition. Do you live in Saudi Arabia or in UK or USA? But well, I will make things easier. Jon can ban me if he wants but I have no more pleasure to visit this place, so to make you happy – this is my last visit here. Sorry for being too complex for simple Fedfans 🙂 I’m also leaving the world of Fedfans, whatever the place. I actually hate Fedfans, which has nothing to do with Fed of course. Can you follow me? No? OK, that’s what I just expected. PRF, what are you even thinking?… Tennis doesn’t need penalties when the game is in state of play. Tennis needs penalties when the game is in state of pause. For example, if a player is suspected of excessively slowing down the game. BTW, what do moonballs and serve delays have even in common?!? My intention was/is to disappear from he, but your question is sensible so let me answer shortly. Moonballs or lobs (kind of, very high balls landing on the baseline while the opponent is not at the net, are frequently played to slow-down the game, get the opponent out of balance and yes, to distract him, to make him lose rhythm. But among top class players nobody uses long serve preparation to distract the opponent. Djokovic or Cilic bounce the ball 10-20 times before serving, Nadal makes his antics, others make different sequences of moves. Now think about the new rule and serve clock. The clock doesn’t start automatically. It is manually started by the umpire and can be paused, all at discretion of the umpire. And definition of when the serve is recognized as started is not strict. It”s up to the umpire. What does it mean “to start the serving movement”? Staying on serving position and starting the routine of every player. Not the moment of tossing the ball. Still you can repeat if you think the toss was wrong. And of course Nadal is right and it#s defined like this in new rules. After a long rally the umpire has to give extra time (important for both players) before the clock starts. So once more arbitrary decision of the umpire. Was the rally really long? Are players tired and need 10 or 30 seconds to recover? I have never seen Nadal to walk slowly like Delpo or having long discussion with himself like Murray. And here all this seems to be about Rafa. Yes, this is good, this will make Rafa be punished by time-outs. This will not work like this. The clock is a good idea, not seen one good argument against it. Could even be on the screen for tv viewers? J, do we really care about the people at the Day Centre? Yes, PRF, somehow I understand what you mean… Although, I don’t think there should be penalties for moonballs because they are executed when the game is in play and it’s up the opponent to adapt. You are right about the serve movement because this should be a thing that is precised. I strictly believe that referees shouldn’t clock the delay of players serves simply because of the fact that a given referee might prefer one player over the other. That’s why I always mention the idea, that for clocking delays and giving penalties, a tournament should give a timer to people who don’t really have an idea for tennis because those people won’t advantage (probably) one player over the other. I agree with Jonathan, though. I think a clock on the TV feed would be a nice feature. Now to return to the serve movement, this actually an interesting question that could spark debates. My point of view is that when you clock a serve, you should clock it when the player starts his routine and bouncing the ball and stuff. But at the same time, one could also question himself how to stop a player (who is serving) from disrupting the pace of the match by simply slowing himself down between a finished point and his next serve? For example let’s take Del Potro, who takes just too much time between a finished point and a serve.. But again at the same time, one should look at an individual point of a match in order to give penalties fairly. Like you said PRF, what if a rally was long? Basically this issue can be quite easy to resolve but it is also actually more complex than we actually think it is. Still, the rules that are applied today are useless and should absolutely be improved. No, you don’t. I have changed my decision. I will post here so long Jon does not ban me. Let’s Sid have his “democratic “should”-voting”. Maybe you arrange a democratic vote about my stupidity, Sid? Have you all though about skipping my posts so long I’m not banned? So long I have fun while trolling you, I will do it. BTW – thanks once more, Sue, my DT&More blog is doing quite well. Your bad-luck is, I’m typing (and thinking) professional – this is, why my post are that long. Jon, can you limit length of a single post? I can tell you, which WordPress plugin does the trick. And you know, what I’m offering my readers, if their comments are very long? I’m replacing them by Guest Articles, if the commenter is interested. I like long posts and comments. Mostly they are a prove, someone is really interested and ready to invest a bit more time than to post “Go Roger” or “Nice” 😉 BTW – John – sometimes I would like to repost or link some comments from your blog on my blog, of course with adequate comment, where are they from. Is this possible? Thanks for your interesting comment (no matter, how stupid I am ;)). Well, of course I was trying to provoke discussion and this is maybe what Sid found to be a prove of my stupidity. It’s OK too. Some kind of reacting to my provocation. 1. About your concern, umpires to give preferences to some players. There is still a main referee of the tournament and the ATP supervisor. To let start the clock by those, who don’t understand tennis at all would mean, the clock would be started schematically, for instance not taking into account, both players are just after a 50 shots rally and need additional time to be able to continue. 2. It’s maybe your mistake to understand, when the clock should be started. Definitely NOT after the server started his routine (excluding walking, having a talk with linespeople, praying, using hundreds of towels, not accept available balls a.s.o.). The serve clock should start just after the last point was ended, eventually with some delay at discretion of the umpire, whatever the reason (long rally, some external disruption by crowd, butterflies, whatever) and it is stopped by the umpire just when the server starts his serving routine, if it’s ball bouncing, doing any moving sequence, but still staying at the place chosen for the serve. Did you watch Milan? I did. A lot. Just to see how it works. After some initial nervosuity, it worked well and I think, no any penalty was required. The time point, I could observe, when the clock was started, was after the server was ready to get balls from the ballkids. The time was enough to use towel, choose the place, think a while about how to serve. So I’m principally for the serve clock. But very careful with penalties. They are not machines. They are individuals. Nadal is not the one, who wastes the most time for serving. His routine is quite long, but this is all part of the serve. While walking slowly as Delpo, discussing with himself as Andy and similar things is hardly to accept as a part of the serve. And this is just the part, Nadal makes very short. He is walking quick, he is using towels so fast he can. And think ((once more some playing experience would be useful to understand) about every individual serving routine (you cannot prescribe, how it should look like) as something, which is necessary and learned in training and in matches and if you want to destroy some routines, because they are a bit longer, you would destroy the game. Also think about the most important aspect of such time limits. It’s not the game itself, but the costly TV time, so it’s about business and money and the show, not about sports. How often it’s the crowd, who causes delays, disturbing the server, not reacting to umpire’s “thank you”? How do you want to penalize crowds? Maybe actual rules are not perfect. But I think any new ones will be not perfect too. The right way would be to have some testing and then asking players (not fans or crowds), they vahe the Players’ Council and they can vote directly, it’s up to ATP and the Players’ Council. Not so easy. The same about Live Eyehawk with automatic out calls instead of challenges. I have observed it in details in Milan. First some had the reflex to go and watch for ballmark. And as you know, it’s not seldon, that players show the umpire the ballmark, being sure, the EyeHawk verdict was wrong. But the good thing was in Milan, tehere were no discussion, no walking to the net to see the ballmark. This was definitely good for the game and saving time and making matches more fluent. Yeah, but I just have to give up half way through. There are no Kofi Annan UN interpreter WordPress plugins available, unfortunately. Felix Auger-Aliassime has been invited to Dubai in December. What a lucky dog! Roger who? Don’t know what you’re talking about. A good read! Can’t help #Bel20veing, can we? So long I’m still not banned or self-banned definitely. Just one question to Fedfans. You make big noise about slowing-down and distracting, because you see this all in the Fed vs. Rafa optic. What about this Fed’s routine. It’s quite regular. After missing the ball or the shot, while the opponent is serving, Roger asks ballboys for some balls and delivers them to the other side of the court, where the opponent is just preparing for the serve. I understand, what is it for. Not the intention of distracting the opponent but to let the mistake go away from the muscle’s memory. But rules are telling nothing about intentions, only about behaviors . Is such behavior not disturbing or distracting the opponent and maybe also slowing-down the game? Is this allowed at all? Is this not the task of ballboys to deliver the balls, where they are needed? Yeah – I know. Fed was a ballboy some times ago, but now he is no more and maybe not yet again. So what do you think about this routine? Let’s imagine, we have a shot clock. Should the umpire start the clock or wait until all balls are landed on the other side? As Vik pointed, there is no need for penalties during the rally but yes in pauses between points. Does this not happen just during the pause between rallies? Sop what’s your point about this? Vik? Jon? Others? Don’t really know what it’s for, but since the balls need to be on the servers side anyway, and Federer isn’t slowing up play by delivering them there, I have no issue with it. It’s also something so minor no player has ever publically complained about it, unlike the shot clock, which has been a controversial discussion in tennis for years. So don’t equate the two. You have to remember that ultimately tennis is about entertaining the paying fans – and, like it or not, after a reasonable timeframe for the players to recover from the point, they have a responsibility to continue delivering the entertainment they are paid to deliver, which is actual tennis points rather than waiting around not playing actual tennis points. How MUCH time is needed I don’t know, but there are complaints Fromm professional players about others taking time, which means the current number is “too much” or in this case not enforced strictly enough. Maybe it turns out 10 seconds wouldn’t be enough, then if we lived in a 10 second world players would complain about not enough time to recover. Then we’d change it again. That’s how the rules work. We refine them to suit as high a majority as possible and encourage players to entertain without killing themselves. I find it hard to see what part of this you don’t intuitively understand.